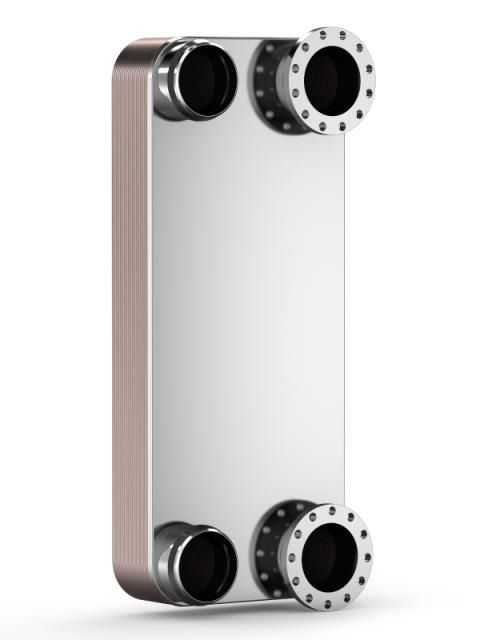 A Brazed Plate Heat Exchanger (BPHE) offers the highest level of thermal efficiency and durability in a compact, low-cost unit. The compact BPHE is constructed as a plate package of corrugated channel plates with a filler material between each plate. During the vacuum brazing process, the filler material forms a brazed joint at every contact point between the plates, creating complex channels. The BPHE allows media at different temperatures to come into close proximity, separated only by channel plates that enable heat from one media to be transferred to the other with very high efficiency. The flexibility of our BPHEs makes them an excellent choice for many applications. The wide range of plate sizes, plate pattern combinations and connections enables a virtually unlimited number of combinations. Tested: Pressure- and leak-tested. All widely recognized pressure vessel codes available, e.g. PED, KHK and UL.